A flying astronomical observatory will be grounded later this year unless outside funding can be found for the project, NASA officials announced Tuesday (March 4). 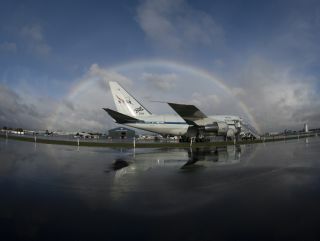 The White House's 2015 federal budget request, which was released Tuesday, slashes funding for the space agency's Stratospheric Observatory for Infrared Astronomy (SOFIA), a modified Boeing 747 aircraft that scans the heavens using an 8.2-foot-wide (2.5 meters) telescope. "This is a very disappointing thing, I think, to a lot of people who have been working on it," Pete Worden, director of NASA's Ames Research Center in Moffett Field, Calif., which maps out SOFIA science flights, told reporters Tuesday. "I'm going to work very, very hard to find international partners on this, to enable us to continue with this mission." This NASA image shows the SOFIA telescope during testing procedures in May 2010, before the instrument's first science flight. NASA already partners with one international organization on the SOFIA mission— the German Aerospace Center, whose German acronym is DLR. NASA chief Charles Bolden has talked to his DLR counterpart about the situation, Worden said. "They are concerned," Worden said of DLR officials. "They've agreed to work with us to see if there's a way forward." SOFIA is the successor to NASA's Kuiper Airborne Observatory, which was retired in 1995. Like Kuiper, SOFIA is optimized to view in the infrared range of the electromagnetic spectrum. During its roughly 10-hour science flights, the observatory cruises at an altitude of 41,000 to 45,000 feet (12,500 to 13,700 m), getting above 99.5 percent of the infrared-absorbing water vapor in Earth's atmosphere. SOFIA also boasts another advantage over ground-based facilities, mission officials say: mobility. The plane can chase down one-off events, such as a June 2011 occultation of a distant star by Pluto, which was visible only from a small area over the Pacific Ocean. SOFIA started flying science missions in 2010. Development costs for the project — which advocates say can help researchers study a variety of celestial objects and phenomena, from star formation and black holes to the composition of planetary atmospheres — totaled around $1 billion and annual operating costs are $87 million, Worden said. The 2015 budget request sets aside $9 million for SOFIA, Worden said. It's unclear if that will be enough to develop a "mothball plan," which NASA and the DLR aim to draw up over the coming months, figuring out such details as where to store the aircraft and how much it will cost to do so. Even if SOFIA does get mothballed, it may take to the skies again someday. The plan would be to store the aircraft with the hope of flying it again once additional funding can be procured, Worden said. "SOFIA has earned its way; it has done very well," Bolden said during a press briefing on Tuesday. "But I had to make a choice."